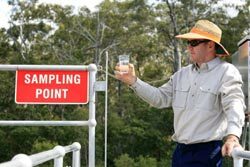 At times, a Phase One Environmental Site Assessment produces findings that require a more detailed, invasive investigation. Phase Two Environmental Site Assessments might include an evaluation of physical facilities, soil, and/or groundwater. Environmental Site Assessment Report which details the findings of the on-site work activities so that management decisions can be made. Environmental support Network, Inc. is educated, skilled, and experienced in the conductance of these ESA's and will work to deliver the information so that business owners and property managers can proceed with or discontinue the pursuit of the transaction.